I am becoming more and more interested in trying a Warrior Dash. Three miles and ten obstacle courses? I could handle that. I think I have worked hard enough for the past three years to the point where I could describe myself as being in good shape. Not great by any means, but not too shabby if I do say so myself. However, something is stopping me. I find the Warrior Dash a bit intimidating, although I feel I’m in better shape now. I mean the name alone speaks volumes. WARRIOR dash. Although the warrior 2 pose is my favourite yoga stance, I’m a bit of a Scaredy Squirrel by nature. 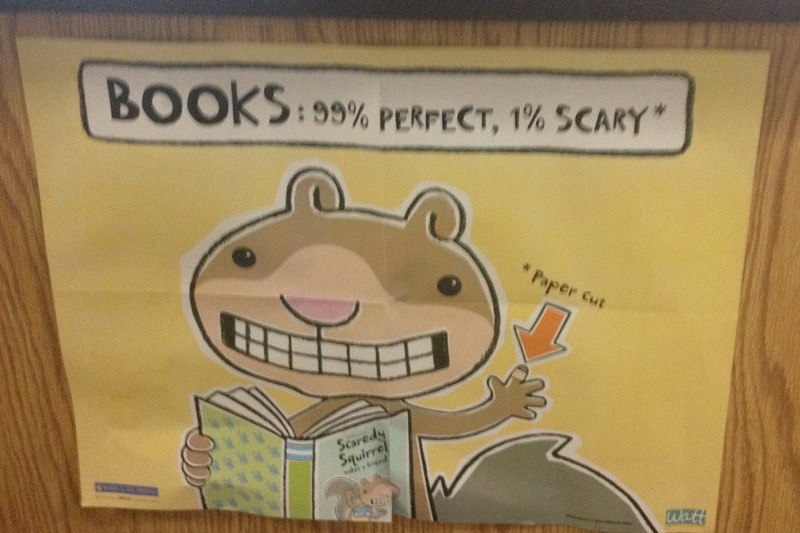 Have you heard of Scaredy Squirrel yet? If you work with children or have children, then you might know this little critter. He is the main character found in an adorable and hilarious children’s book series by Canadian author Melanie Watt. Scaredy is a rather anxious little rodent, who is somewhat of a risk analyst. A risk-taker he’s not! Scaredy Squirrel will obsess over every decision he makes to decide if there is any potential harm in his choices. A chance-taker he is not! Scaredy likes to play it safe. The opposite of Scaredy Squirrel is found on one of my current favourite TV shows. History TV’s Vikings. Director Michael Hirst takes us on an amazing odyssey as these Northmen try to discover new lands, more riches and more power, often in a very brutal manner. Main character Lagertha is a warrior/shield maiden who does not often consider risks or danger when going after what she wants (very much unlike Scaredy Squirrel.) In the Viking era, many women fought alongside their male counterparts in raids. These courageous feminine souls were not afraid of dying in battle and were also known to be just as lethal as the men with the shield and weapon. You do not want to mess with Lagertha. Kalf, what are you thinking?? Remember what happened to her second husband. A usurped woman is a scorned woman. Attempting second set of plank jumps and feeling a little like Scaredy Squirrel right now…. How much of a risk-taker are you? One being Scaredy and ten being Lagertha. Have you ever tried a Warrior Dash? How challenging was it? You go girl and Warrior Dash. You’ll be covered in mud and have the best-est time! It looks like serious fun. Not to mention the furry horn helmets. The mud is kind of inticing me. Lol! Thanks for the tips. Never thought of that. All your pull up training will come into it’s own too. Full all the way to the bar or not, it’ll pay off! Get dirty and have fun!! Just go for it, be fearless woman!! Looking fwd to reading the recap!!! Thanks Chels. It does look like so much fun! Definitely go for it! I think you’d regret not doing it. Plus, how fun will it be to channel that inner Warrior within you?! Thanks for the encouragement, Bella. I’ve already channeled my inner Scaredy Squirrel, so warrior would be awesome! I enjoyed reading this post 🙂 YOU CAN TOTALLY rock a Warrior Dash!! Why thank-you. I’ll try to give it my all. Do it, do it, do it…so I can live vicariously through you! I’m a scaredy squirrel BUT I do fight against my natural tendencies quite often. I always feel so happy (kind of victorious) when I do and you’ll be SO proud of yourself if you take on this challenge. I know you can do it and if you decide to go for it I’ll be cheering for you! I’ve never done the Warrior Dash I’m quite intimidated by it mostly the climbing walls being the I’m 5 foot tall I think they would be difficult for me. You are looking strong! Keep it up. Thanks so much, Ivanna. I’m trying! I think you’re a Spartan. Tiny but mighty! I admit, I too am a bit intimidated because I am so clumsy. I think I may skip the fire jumps because I’m on the clutzy side. Wouldn’t want to stumble on that obstacle. You should def do it…tigress knows you can do it. Show Trex how to get out of that comfort zone. Tell scardeysquirrel to step aside and show her how its done. Thanks for cheering me on! I think I would feel like the ultimate tigress if I did this. Scaredy will have to take a back seat if I try this goal for sure.